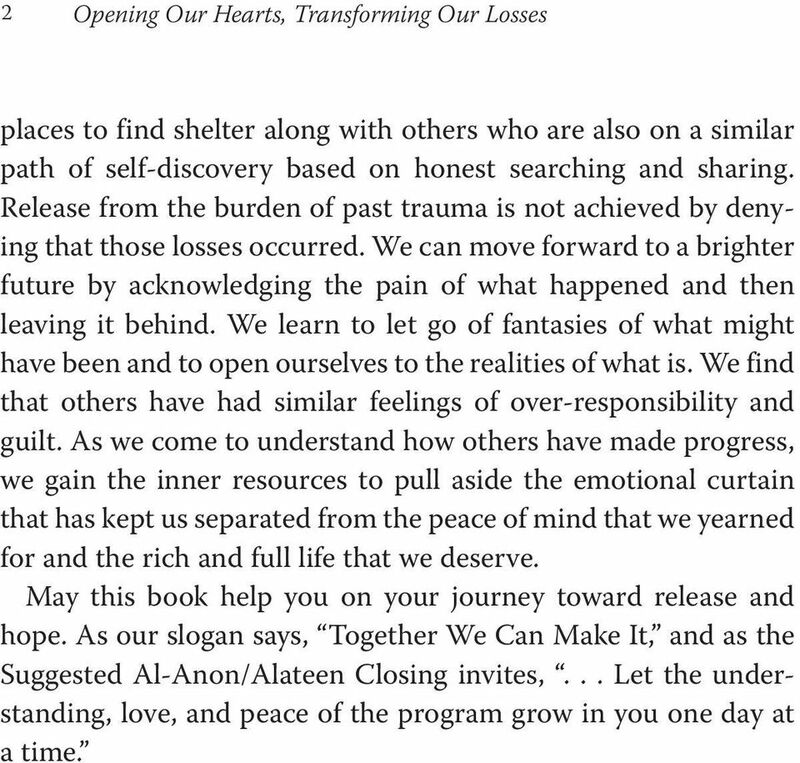 Download "Opening Our Hearts, Transforming Our Losses"
2 Opening Our Hearts, Transforming Our Losses places to find shelter along with others who are also on a similar path of self-discovery based on honest searching and sharing. Release from the burden of past trauma is not achieved by denying that those losses occurred. We can move forward to a brighter future by acknowledging the pain of what happened and then leaving it behind. We learn to let go of fantasies of what might have been and to open ourselves to the realities of what is. We find that others have had similar feelings of over-responsibility and guilt. As we come to understand how others have made progress, we gain the inner resources to pull aside the emotional curtain that has kept us separated from the peace of mind that we yearned for and the rich and full life that we deserve. May this book help you on your journey toward release and hope. As our slogan says, Together We Can Make It, and as the Suggested Al Anon/Alateen Closing invites,... Let the understanding, love, and peace of the program grow in you one day at a time. 4 Opening Our Hearts, Transforming Our Losses different than we had hoped or expected. Before long our trust and intimacy begin to erode, and our relationship with the alcoholic starts to deteriorate. Over time the culmination of losses can take its toll on us. Those of us who grew up in alcoholic homes grieve for our childhoods. Painful memories from our past can consume us with grief, or we may spend years without realizing we are grieving. As children, any change could trigger feelings of loss. I wanted everything to stay the same and I didn t accept change well. I resented it; talked about how things used to be; and longed for old homes, toys, pets, and fun times. Even memories of good times with our families can trigger sadness, since those times were often tainted by the awareness that they wouldn t last. We may feel a sorrow so deep we often can t find the words to speak of it. 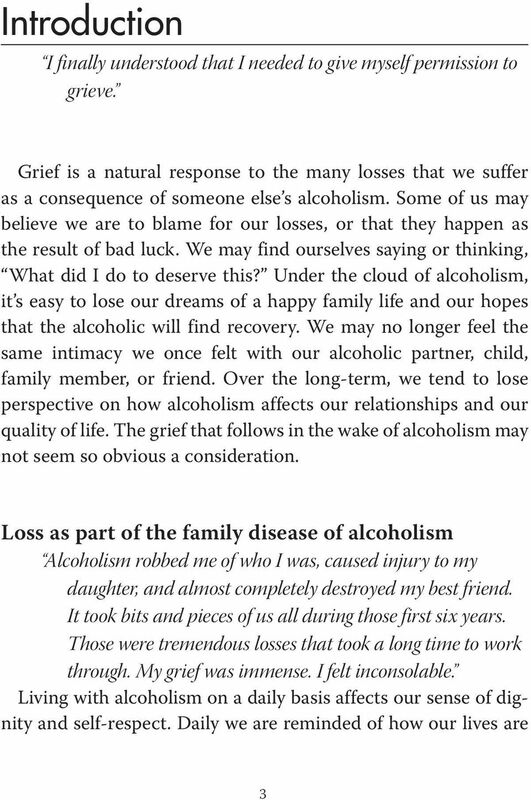 It s not just about death When we first begin to understand how alcoholism has affected our lives, we may not fully recognize our feelings of grief and loss. We may tend to minimize or deny the pain by telling ourselves, Well, at least she isn t dead, or, Things could be worse. True, things probably could be worse, but they re also probably tough enough just as they are. 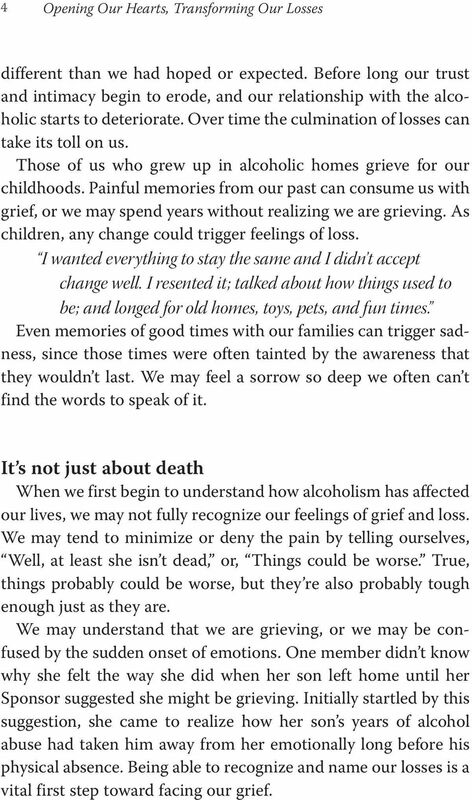 We may understand that we are grieving, or we may be confused by the sudden onset of emotions. One member didn t know why she felt the way she did when her son left home until her Sponsor suggested she might be grieving. Initially startled by this suggestion, she came to realize how her son s years of alcohol abuse had taken him away from her emotionally long before his physical absence. Being able to recognize and name our losses is a vital first step toward facing our grief. 5 Introduction Before recovery, I used to think grief only happened when someone died. 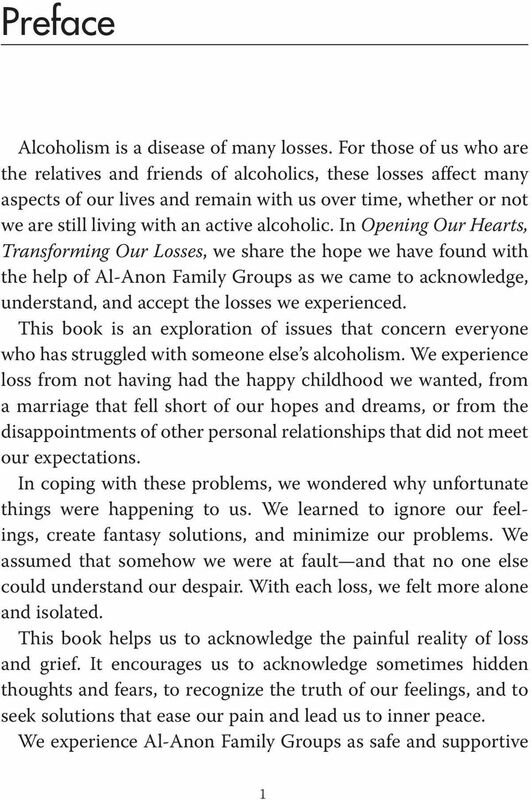 I had been in Al Anon for several years before I read about grief in relation to alcoholism. It started to make perfect sense to me when I understood that much of my sadness, anger, and mixed-up feelings were signs of grief. I was losing my battle with trying to control the alcoholic in my life. At last I could see I was grieving. As I got more and more honest, I saw that I had been in grief much of my life, but had no name for it. Recognizing my grief seemed to offer me a sense of dignity. I finally understood what was happening to me. I now use this knowledge when I experience small losses or big ones. 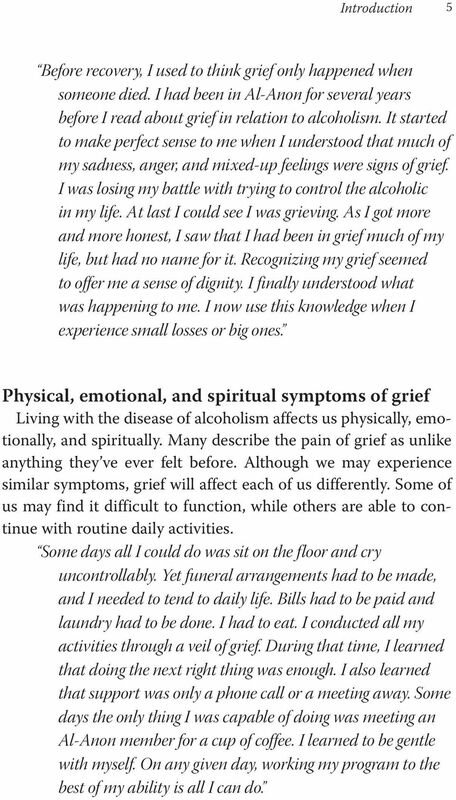 Physical, emotional, and spiritual symptoms of grief Living with the disease of alcoholism affects us physically, emotionally, and spiritually. Many describe the pain of grief as unlike anything they ve ever felt before. 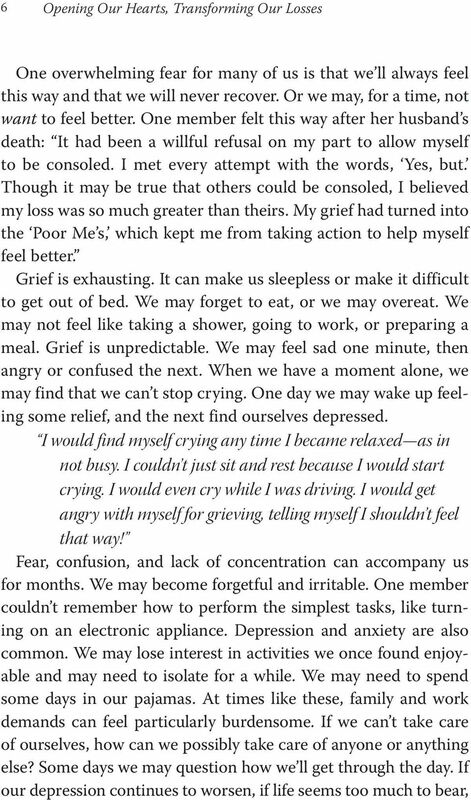 Although we may experience similar symptoms, grief will affect each of us differently. Some of us may find it difficult to function, while others are able to continue with routine daily activities. Some days all I could do was sit on the floor and cry uncontrollably. Yet funeral arrangements had to be made, and I needed to tend to daily life. Bills had to be paid and laundry had to be done. I had to eat. I conducted all my activities through a veil of grief. During that time, I learned that doing the next right thing was enough. I also learned that support was only a phone call or a meeting away. Some days the only thing I was capable of doing was meeting an Al Anon member for a cup of coffee. I learned to be gentle with myself. On any given day, working my program to the best of my ability is all I can do. It s an awfully risky thing to live. Carl Rogers. her family. Daily routines that people were used to are now gone. Coping with Grief & Loss Losing someone or something you love is very painful. After a significant loss, you may experience all kinds of difficult and surprising emotions, such as shock, anger, and guilt. Moving on! Not Everyone Is Ready To Accept! The Fundamental Truths Of Retail Trading! Introduction to Substance Abuse. Matthew D. Bennett, Psy.D. Rick McNeese, Ph.D. First Step Recovery, Inc.
Change Cycle Change often involves a process. The Bible describes five significant stages of change that are important to understand. They include Rebellion, Realization, Remorse, Repentance, and Restoration. Life with MS: Mastering Your Career Dear Friends, For many of us, working gives our lives a sense of purpose. Now that you have multiple sclerosis (MS), you may be asking yourself, Can I keep working? It s Not Right! Neighbours, Friends and Families for Older Adults What You Can Do to Keep Yourself Safe From Abuse Everyone has the right to be safe and free from abuse. No one should experience abuse. Are you feeling... Tired, Sad, Angry, Irritable, Hopeless? Helping Children When a Family Member Has Cancer: Dealing With a Parent s Terminal Illness For most people this is a painful and personal topic, and the information shared here may be hard to read at times. ŒŒŒŒ THE 5 BIGGEST MYTHS ABOUT POTTY TRAINING AND THE TRUTH ABOUT GETTING DIAPER FREE IN JUST ONE DAY! Index. Substance Impaired Driving. Complicated Feelings and Reactions. Physical Impact. Mental Impact. Emotional Impact. Delirium. The signs of delirium are managed by treating the underlying cause of the medical condition causing the delirium. Solutions that end addiction. Helping the Addict or Alcoholic Begin the Journey to Recovery through Intervention: It can be challenging to help a loved one struggling with alcoholism or drug addiction. Is someone you know being abused? Do you know the warning signs? Grief is the outcome of loving and losing someone in life. It is a common human experience. Grace to you and peace, from God our Father and from our Lord Jesus Christ. Hope, Help & Healing. A guide to helping someone who might have a drug or alcohol problem. www.warecoveryhelpline. Hope, Help & Healing A guide to helping someone who might have a drug or alcohol problem www.warecoveryhelpline.org 1-866-789-1511 Are you worried that someone you care about has a drug or alcohol problem? Louisiana We are so proud to announce that we are 100% debt free! Praise God! We started our business with over a million and a half dollars in debt. Being a Guarantor. Financial Series. in Alberta. What is a Guarantor? June 2011. Has someone you know asked you to be a Guarantor? What Do These Students Have in Common? They are college students who got depressed...got treatment...and got better. Jamie is a social worker serving as a research therapist at the University of Washington MS Rehabilitation Research and Training Center. U NDERSTANDING THE NEED FOR C USTOMIZED F INANCIAL S OLUTIONS P ERSON P ERSON. Pastor Spotlight Martha Fisher, CBC Women s Pastor Inspiration Martha Fisher, Women s Pastor at Community Bible Church, leads with a passion to reach, teach and help the women of our community for Jesus. If You Are in a Divorce Or Just Thinking Of Getting Divorced In Colorado Don t Do Anything Until You Read This Special Report! It s helpful to watch the video Who is Slick on the slickrecovery.com website before completing this form.